We at ZiMAD continue to follow one of our best traditions and, as usual for the month of October, Magic Jigsaw Puzzles is going pink in honor of Breast Cancer Awareness Month! By purchasing specially marked puzzle packs, every jigsaw player will be donating to National Breast Cancer Foundation, a non-profit organization that helps women around the world providing support and inspiring hope to those affected by breast cancer through early detection, education and support services. ZiMAD is a proud partner of NBCF and we’re glad to contribute to the fight against breast cancer. Breast cancer is the most common cancer in women worldwide, with nearly 1.7 million new cases diagnosed yearly. This type of cancer makes up 25 percent of all new cancer diagnoses in women globally. Breast cancer is hormone related and doesn’t depend on nationality, race or economic rankings. Your support helps raise awareness and funds that help people reduce their risk of cancer; provide free programs and services for breast cancer patients; and fund groundbreaking breast cancer researches. 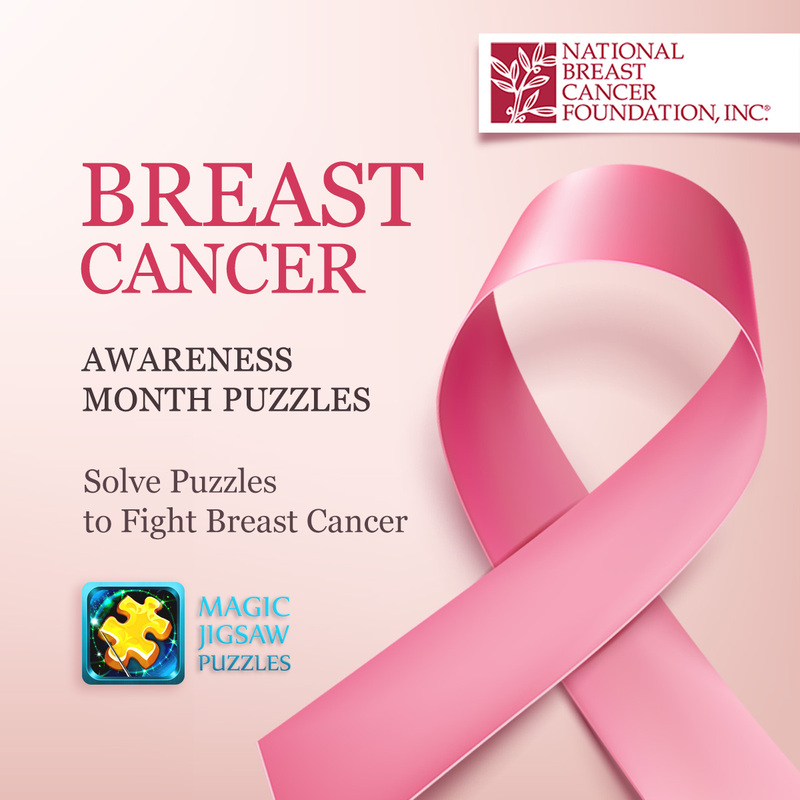 100% of proceeds from puzzle packs marked with a pink ribbon will be donated to NBCF. We’re also releasing a free pack of photos curated by five breast cancer survivors and inspired by their touching stories of victory over this terrifying disease. We will be posting updates on the progress of this charity campaign on our social media channels and compose a detailed report after the end of the charity program. Let’s fight breast cancer together!